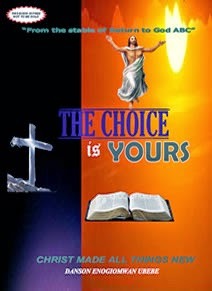 Coming Soon – New book release: The Choice is Yours: Revolutionary Revelations by Danson E. Ubebe offers to all the definition and knowledge of the grace of God. Dispelling common misinterpretations of scriptures relating to the grace of God, Ubebe, as inspired by the Holy Spirit, reveals to readers shocking revelations that explain and shed light on the unfathomable grace of God from a biblical viewpoint in respect to eternal faith. This knowledge of eternity gives mankind a choice. He explains this choice of eternity concisely, offering an understanding of how to evaluate your personal standing with God, making way for the Kingdom of God to manifest in your life. Challenging and thought provoking, the author highlights biblical truths in reference to eternal faith, the prosperity of man and the reiteration that man was appointed to die only once. Come and learn how free will intertwines with the grace of God and eternity, offering to all that would seek the Kingdom of God's righteousness eternal life forevermore! Danson E. Ubebe was a Shell engineer of over 33 years; now retired, he currently spends his time writing Christian books under the inspiration and unction of the Holy Spirit, spending countless hours being taught and led by the Holy Spirit, who is known as, "The Teacher." His newest release reveals long misunderstood scriptures that will intrigue, engage and challenge readers to evaluate their own lives in light of free will, eternity and the grace of God offered to all. The author offers clarity to these misinterpreted truths and the reality of the grace of God by poignantly examining mankind before Jesus Christ, compared to after His death, burial and resurrection, giving understanding to the true inner man of mankind: in that all humans are spirit, soul and body - a very uplifting, informative and biblical read for those that desire an understanding of God, eternity and faith in Jesus Christ. Available May 28, 2014 - To understand your choice, pick up your copy of The Choice is Yours at Amazon or at Troubador Books.